Apricots are not grown as frequently as most other fruit, partly because they are not very easy to grow and partly because, with limited space, most gardeners prefer to grow the more luscious peaches. Home-grown apricots may well be a revelation, however, because they taste much better than shop-bought fruit ever does. One of the problems with apricots is that they flower very early and are suscept­ible to frosts. They are, therefore, suitable only for warm areas. Their need for warmth means that they are best grown as fans against a south-lacing wall, which will help to protect them from the cold. They are sell-fertile, so there is no need for different varieties and only one tree need be grown if space is limited. A warm, sunny, frost-free site is required to grow apricots successfully. The soil should be free draining but moisture retentive. You will have to incorporate plenty of organic material before planting. Plant in autumn or early winter, placing fans about 4.5m apart. The blossom will need to be protected if there is the possibility of frost. Mulch the ground with a good layer of manure and keep the ground watered during dry spells. If there is a potentially heavy crop, thin out the fruits to about 8cm apart. On mature fans pinch out the laterals in summer to about 8cm/3in. Remove any laterals that face towards or away from the wall. Later, in summer, remove any more laterals that have developed. 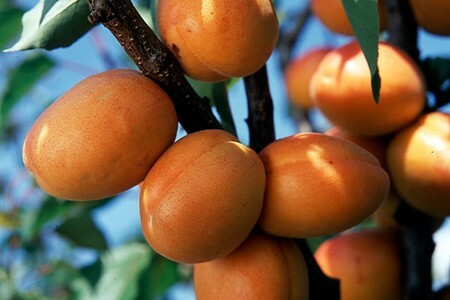 Apart from that, little pruning is required because most apricot fruit is borne on old wood. Every few years, remove some of the older wood and allow new laterals to develop in order to replace it. Pick the fruit once it has fully ripened and can be removed easily from the stalk. Apricots do not store well, although they can be frozen or dried. Protect fruit from birds by netting. Aphids may also be a problem. The most likely diseases are silver leaf, canker, brown rot and die back.